Humans are not computers, we can't just click "save" and expect information to be stored permanently. Spaced repetition, also called distributed practice, is one of the three primary methods I train my tutors to incorporate into their sessions. It is one of the best ways to help students move information into long-term storage. Humans are not computers, we can't just click "save" and expect information to be stored permanently. So what is spaced repetition? Well, the name kind of gives it away: to remember something, you must go over it once, then again, and again, and again, until it’s moved into long-term memory storage. Sounds stupid and obvious. But here's the trick: wait for longer and longer periods of time before trying to recall the information each time. In psychology, this technique is called the expanding spacing effect and it has been shown to be much more effective to help people learn new skills and recall new information. Then try to recall cards 2 and 1 again. Look over card 4, and try to recall 3, 2, and 1 again. Then look over card 5 and try to recall 4, 3, 2, and 1, and so on. See what’s going on? You are forced to recall the pieces of information over and over again, but with more time between each recall since you are adding another piece of information to the list each time. As soon as you think you have card 1 down, then set it aside and come back to it when you are on card 10, and then again when you are on card 15. If you do this with all of your cards, removing the ones you know each time, but coming back to them towards the end, you will have everything memorized in a much shorter period of time. Contrast that to what most students do: make a stack of notecards and go through all of them before returning to the first card, usually 5-10 minutes later depending on the size of the stack. A lot of students then stop after one or two rounds and say “I’ll do it again later tonight or tomorrow.” A better student would go through them one or two more times, but then put them away and not come back to them until hours or even days later. This is spaced repetition, but in an inferior form. Students realize they need to go over something several times before it sinks in, but they don’t know the optimal method for doing it. Plowing through a stack of notecards consecutively, putting them down, and coming back to them much later doesn’t work well because the physiological processes required for the brain to make new memories and preserve them aren’t optimally triggered or reinforced with this timing pattern. Yes, there are actual biological/physiological processes required for memory formation and those processes can be optimized by hitting them at the right times. It’s analogous to lifting weights at the gym — if you consume protein immediately after the workout, you’ll build muscle faster than if you wait a few hours. Your brain cells must form new connections between them to recall new information. They require multiple jolts to do this, and must be jolted again hours or days later to reinforce the newly-made connections. Otherwise, they’ll disappear. This process is called “pruning.” Stop your brain’s gardner from pruning your cells by using Spaced Repetition! Using the latest scientific literature on spaced repetition and my own personal experience, here are the 3 most important keys to this method. Key 1: Spacing between recalls. It is important to keep the spacing between recalls shorter at first and then increase the spacing with each successive recall. Research shows that if you need to remember something for several days to a month later, which is often the case for exams, your last recall should be at least a day after your second to last recall. If you want to remember something for an even longer period of time, maybe 2-3 months, you should space your last recall a few days or a week after the second to last recall. Key 2: Adjust the method for your brain. Some students need to go over something 10 times before it moves into long-term storage, while some students might only need to see it 3 or 4 times. So let’s say you need to remember some information for an exam in 2 weeks and you typically have to go over something 8 times before you remember it. In that case, your spacing between recalls might go something like this: 15s, 1m, 5m, 15m, 1h, 3h, 1d, 3d. If your brain absorbs information quickly and you only need to see something 4 times before it’s solid, you might use these spacings: 5m, 1h, 3h, 1d. Key 3: Make sure you’re not just reading your notecards again each time. This is tremendously important! Just reading your notecards doesn’t help your brain store the information. You must use “Active Recall” if you want to actually remember the information. This means you must not be looking at the notecard or sheet of paper when you’re recalling what that the nucleus does – you have to force your brain to produce it from scratch. I’m sure you’ve noticed your brain is a very lazy creature. It doesn’t want to form new memory pathways unless it absolutely must. You’re not going to have your notecards with you when you take the exam, so you can’t be looking at the answers when trying to recall the information. It’s okay to take a glance at which part of the cell you’re on, but look away before you recall it’s function. In our notecard example, be sure to put the function of the cell part on the back side of the card so you can’t see it. And that’s basically it. Expanding spaced repetition is a very simple concept but you have to do it right to get the maximum benefit. One thing you might be thinking is “What am I supposed to when I’m waiting to go over the information again? Just sit there for the 5m, 30m, or 1 day?” Of course not! You can be a spaced repetition machine and be studying multiple things, or even multiple subjects, at once, just rotating them in when appropriate – like a blackjack dealer shuffling multiple decks of cards. For those really dedicated students, another great idea is to keep whatever set of notes or notecards you’ve just finished and make a reminder to go over them again in a few days, and then a few weeks later. This will help you prepare for the final exam. By the time that dreaded week rolls around and your classmates are curled up in the fetal position crying for mommy to make it better, you’ll hardly have to exhaust a brain cell because you’ve been ready to take the final exam for weeks! So what science backs up spaced repetition? Tons. The method was first introduced about 130 years ago by Hermann Ebbinghaus in his book Memory: A Contribution to Experimental Psychology. He experimented on his own memory by trying to recall lists of words. He saw diminishing retention rates with time that were improved using spaced repetition. The basic conclusion of these studies is that the longer you need to remember something, the later your last recall should be. They indicated that one day minimum spacing is best for something that has be remembered for days to weeks, a typical exam studying timeline. People were able to remember as much as 30% more on tests they took 8-30 days later if their last repetition was 1 day after the previous one. 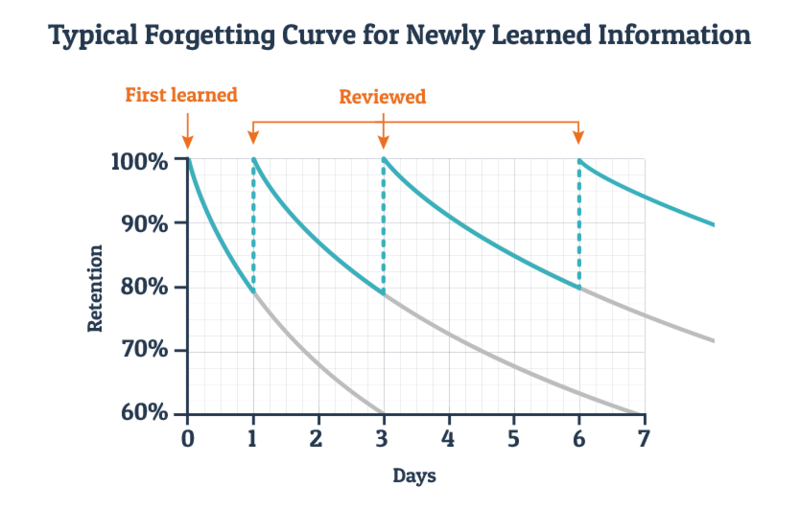 Spaced repetition and its physiological explanation might be bad news for students who procrastinate and pull all-night cram sessions before big tests. But if you want to see big gains in studying, you’ve gotta break the bad habits. Using spaced repetition might seem like it requires more time, but that’s not true – all the scientific studies made sure the total amount of time studying the material was the same, whether it was in one big chunk, or broken up into smaller, spaced out sessions. Spaced repetition does require more discipline because you have to make sure you review the same material at increasing intervals, and the session a day later is of critical importance. If you procrastinate and cram you actually end up putting in more time over the course of the semester because your brain can’t hold onto crammed information as well as material learned using spaced repetition, which just causes a super exhausting cram before the final. If you plan to pursue a particular field of study you are always required to learn and remember certain fundamental concepts. Take the time to do it right and you won’t have to waste time relearning material 5 times over. Not to mention you also reduce your stress by not relying on all-nighters. What if you get sick just before the exam? Not a problem if you’ve used spaced repetition, but if you’re counting on a highly-productive cram session to make the grade, well, good luck Sniffles. The science overwhelmingly proves spaced repetition is a superior study method to cramming. Increase the spacing between subsequent repetitions. Use small spacings at first and larger spacings each time. The most important repetition is the one that’s at least 1 day later. Implemented properly, spaced repetition will save you time and stress and you’ll remember information for much longer than your peers. Final exam, you were born ready for it! Cepeda NJ. Pashler H. Vul E. Wixted JT. Rohrer D. “Distributed practice in verbal recall tasks: a review and quantitative synthesis.” Psychological Bulletin. 132. 3:354-380. 2006.